The sun is out and spring has sprung so I decided we needed something to eat to match the sunshine outside. I was having a look at various recipes (a common hourly occurrence for me) and seen some pasta dishes, one of which had avocado so that was it, decision made, something with pasta and avocado. I do like Caesar salad dressing too and decided I wanted to use some anchovies in the dressing for that ‘kick’. I do like just having a look to see what I have in the fridge/freezer and building a dish from that and this is just one of those dishes. I started by boiling a pot of water and added salt and olive oil then added the spaghetti, it was the nice thin spaghetti, so doesn’t take too long and also great for dishes that are served cool/cold. I then cut and scooped the avocado flesh into a bowl and with a fork I mashed it up a bit, added some lemon juice and a crushed garlic clove and gave it a good mix. Gave it a taste for seasoning and before I added any salt I added the anchovy paste, another taste and then a little salt just to bring all the flavours together. Then just to finish off the Caesar dressing theme, I added some grated Parmesan cheese and that was it. I decided to have a look for some vegetables and off to the freezer I went, of course you can use fresh if you have, but I was using what I had to hand. 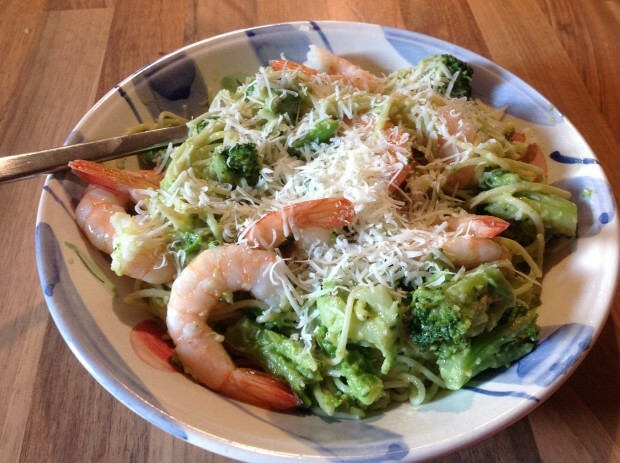 So some broccoli, asparagus and large prawns from the freezer and we had all of the ingredients ready for this dish. Once the spaghetti was ready, I removed it to a colander and added the frozen broccoli and chopped asparagus to the boiling pasta water and allowed them to defrost and warm through. I defrosted the prawns and then we were ready to bring everything together. I drained the veg and placed it back in the pot, then added the spaghetti gave it a little mix and then added the avocado dressing, making sure that the dressing and the spaghetti was well combined. Then the final ingredient is the prawns and I added them to just combine all the elements together. Then it is just to split the spaghetti to the bowl and grate a little more Parmesan over the top and ‘Viola’ you have a wonderful meal. 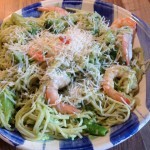 Delicious juicy prawns in a bowl of spaghetti with broccoli and asparagus in an avocado sauce. Summer on a plate. Place a large pan of water onto boil, add 1 teaspoon of salt and 1 tablespoon of olive oil to the water before adding the spaghetti. Once the pasta is ready remove to a colander to drain, add a little more oil to ensure it does not stick together. Cut and spoon the avocado into a bowl, add the juice of half the small lemon and mix together, add the crushed garlic clove, salt and anchovy paste and mix again. Taste and adjust the seasoning as required. Add 20g of Parmesan cheese and mix. Leave to the side. Add the frozen broccoli and asparagus to the pasta water and allow to simmer for 3-4 minutes to defrost and heat through. Remove the vegetables to a bowl. Add the pasta back into the large pot, add the vegetables and mix together, then spoon over the avocado mixture and mix again to mix and coat the spaghetti with the dressing. Then add the prawns and serve into 2 bowls. Top with the remaining 10g of Parmesan Cheese.